Onavo, a startup that offers five apps across iOS and Android to help users track and compress the amount of data they use on the Internet, as well as protect their information online, has published new data today revealing the most popular video games being sold on the App Store. To help users catch the biggest data-hogging culprits on their mobile devices (and for the entire service to work really) Onavo requires users to send them information about their data consumption habits. That gives the company some pretty accurate and valuable metrics on mobile app usage, which has resulted in Onavo Insights. 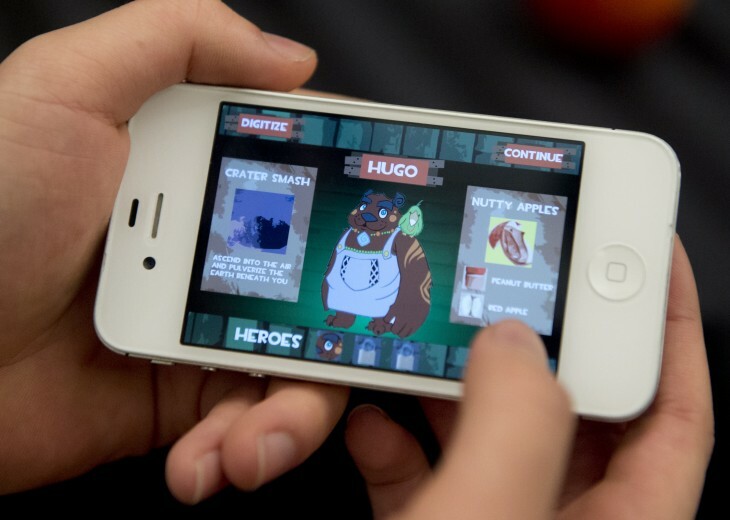 The company’s latest study, released today, examines a plethora of video games downloaded and played by iPhone owners during April 2013, with a sample size that was “well into the millions,” according to the company. The results found that arcade games garnered the highest market share in the App Store, with 66 percent of gamers downloading and playing titles such as Subway Surfers and Sonic Dash. The action category, which featured mammoth hits Temple Run and Clash of Clans, followed at 57 percent. Rounding out the top four were puzzle games and word-related games with a 49 percent and 42 percent market share respectively. 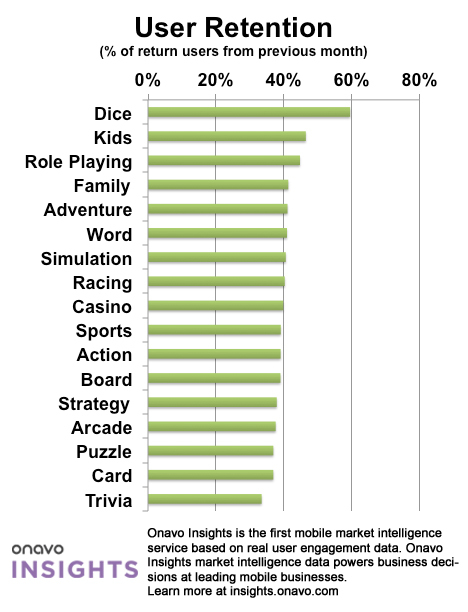 These figures represent not only what gamers are interested in playing, but also the types of games being created by both independent and large-scale developers alike for iOS. After all, if there’s only a smattering of racing games available in the App Store, it should come as no surprise that gamers are spending less of their spare time playing them. The flip side to this argument is, of course, that developers arguably create video games based on what players are interested in. The eruption of Temple Run, for example, triggered a wave of other ‘endless runner’ titles trying to capitalize on Imangi Studios’ success. Data related to user engagement, or the amount of time gamers spent playing each game over the four-week period, shows a rather different story, however. So-called ‘dice’ games, which represent various casino activities such as slot machines, came out on top with more than 10 days played on average. It’s a little worrying, but plays into the belief that any form of gambling can be highly addictive for some players. Simulation cranks in at second place with 9.3 days per month, on average, which again makes sense given the time-sink nature of something like The Sims 3 or hyper-realistic flight simulators. 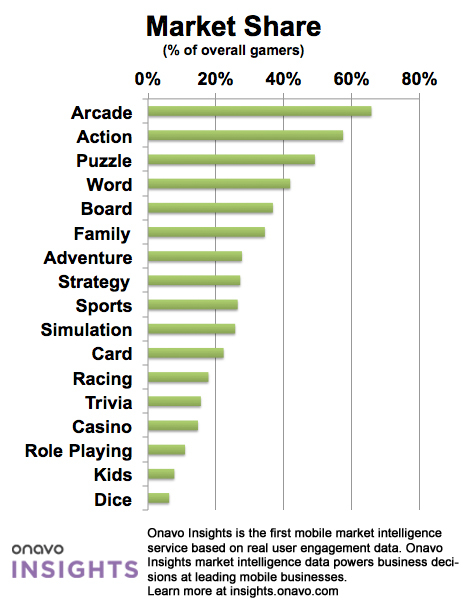 Casino is also in the top five genres here, but of note is ‘arcade’ all the way at the bottom. This ‘hero to zero’ trend can be attributed, at least in part, to the short gameplay sessions and ‘pick up and play attitude’ which titles such as Ridiculous Fishing thrive on. It’s not to say that players don’t enjoy them – not by a long shot – but it does highlight the varying play styles pioneered by these different genres. Retention, last but not least, points to the lasting appeal of games in the App Store. It’s an important metric which often highlights the underlying quality of a game such as Angry Birds or Plants vs. Zombies. 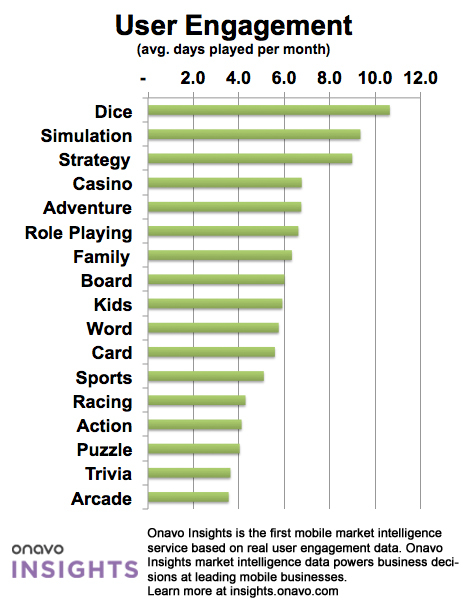 Here dice games continue to come out on top, while kids titles and role-playing games (RPG) follow in second and third. The high placing of RPGs is perhaps expected, given the longer campaign length of something like Final Fantasy IV or The World Ends With You: Solo Remix. Genre popularity will no doubt fluctuate from month-to-month, but it’s always valuable to take a snap-shot of current consumer trends. Gaming is one of the most popular and successful sections of the App Store,and shouldn’t be underestimated as a contributing factor to the continued success of the iOS platform.